Inspired by J.R.R. 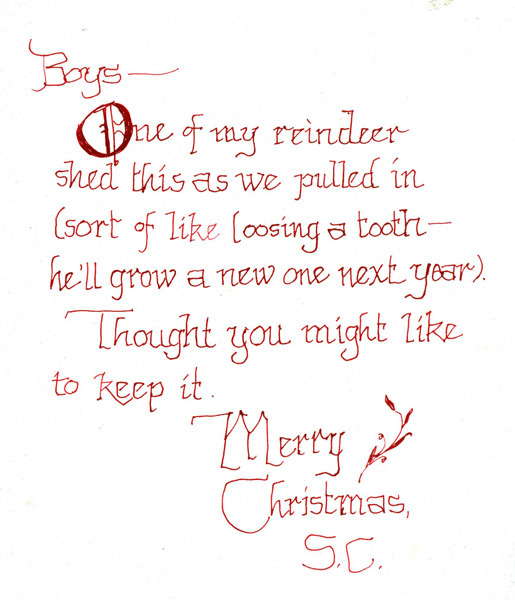 Tolkein’s The Father Christmas Letters and an antler I found one Christmas Eve, I began writing letters from Santa to my children in 2004. When my sons grew too old for such things, there was a lull in the letters—until three years ago, when I passed on the antler with a letter to my neighbor’s young boys. The letters are among my favorite Christmas traditions and so I am pleased to continue it for another year and to share the fun more widely here with you. 2015 Christmas Letter. Written with a traditional dip pen in Calli waterproof calligraphy ink; watercolor illustrations. 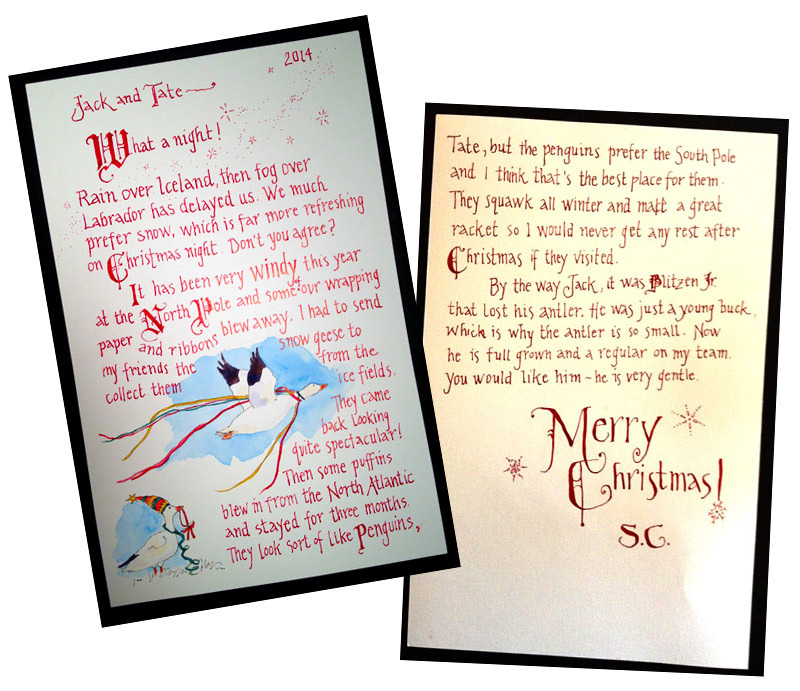 This entry was posted in Journal and tagged hand lettering, holiday, ink, letter from Santa, winter by Jean Mackay / Drawn In. Bookmark the permalink. Beautiful and so creative too! Your sons are lucky to have you. Merry Christmas, Jean! Thanks Laura– Merry Christmas to you, too! These are wonderful and imaginative. What a treasure. Thanks Jean– Glad you enjoyed them! Hi, Jean. I subscribe to your blog posts, but I’m not sure I’ve ever commented. I love your artwork, and your Christmas letters brought tears to my eyes. What a wonderful tradition! Thanks for taking the time to leave a comment! I sometimes feel like I’m shooting in the dark when I post. I’m so glad to know the letters were touching for you. What a delightful idea. I think I will “steal” this idea for next year for my youngest granddaughter. She will be thrilled to get a letter from SC himself! Maybe I’ll do a letter this year since she has just moved from TX to AZ a couple of months ago and perhaps SC had a little difficulty finding her on his map. We’ll see. Love your posts. Merry Christmas to you! These letters are beautiful. I would love to see more of them. Would that be possible? Hi Karen- glad you enjoyed the letters. I didn’t scan the others, but I could when next at the library. Maybe I can do that and then email them to you or post them here as an add on. I’ll let you know after the holidays. That would be wonderful. Thank you for sharing the Christmas magic! I am quite magical, Karene! My best to your family– let’s try to catch up in the New Year! Thanks, Jean, for sharing these with all of your followers. They are beautiful. 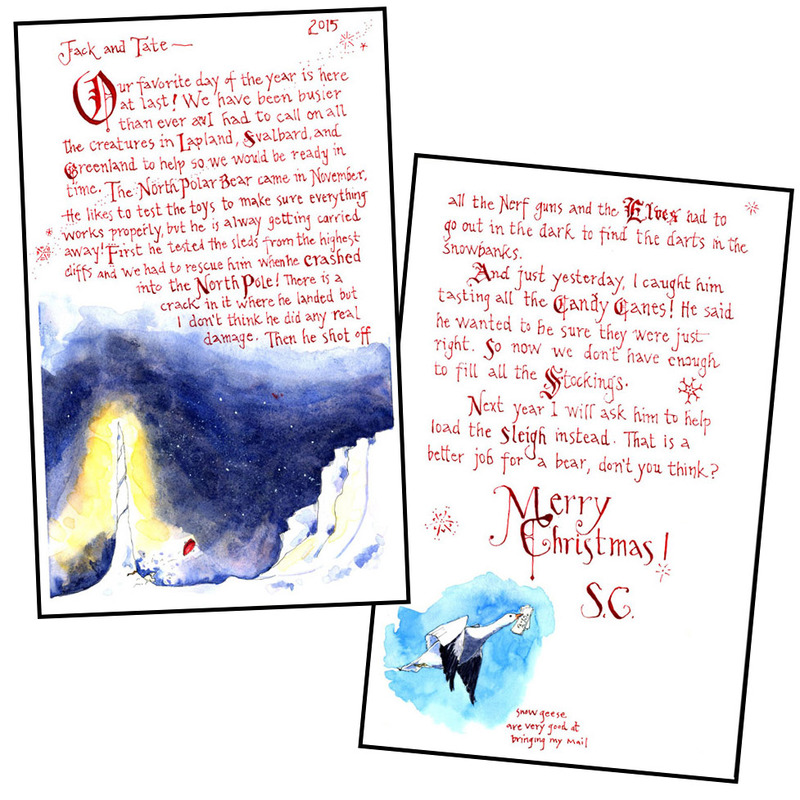 I loved Tolkien’s ‘Father Christmas Letters’ also. I wrote letters in a similar way to our sons (now young men in their 30’s!). I didn’t illustrate them or save them unfortunately. I thank you for reminding me of a tradition when they were wee lads! If I am ever a grandparent maybe I can do it again! Tolkien’s letters are quite special– how fun that they inspired you too! My husband and I want you to publish all your letters as a book for everyone’s grandkids to read at Christmas. And, of course, for us grandparents! Thanks Rita! Most of the letters I have written are personal to the kids I write them for, just as J.R. Tolkien’s Christmas letters were. I highly recommend getting a copy of Tolkein’s The Christmas Letters to read to your grandchildren! I’ve just discovered you and your wondrous art…it feels like a gift! Thanks so much Lynn. Glad you found me and keep in touch with comments anytime. What great memories – beautiful! Thanks Joan– Tis the season for me to be thinking about this year’s letter.